Submissions are now being accepted for the 2016 Dankworth Prize for Jazz Composition. 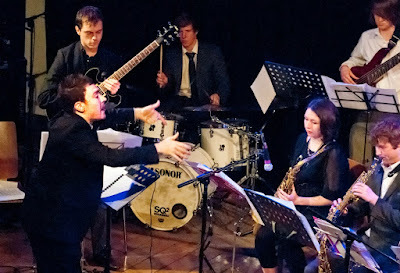 There are categories that composers may submit works to - the Big Band category and the small ensemble category (between 7 and 9 players). A winner will be selected from each category and will each receive £1,000. This prize fund was set up in memory of John Dankworth and has run since 2008. Three Northern composers have received the prize including James Hamilton (pictured above) in its inaugural year, James Beckwith (LCoM alumni) and Matt Roberts (Darlington-born LCoM alumni). Submissions will be accepted until 3rd December 2015 and interested parties should visit the Worshipful Company of Musicians website to download the information sheet and application form. Applicants must be aged 28 or under.